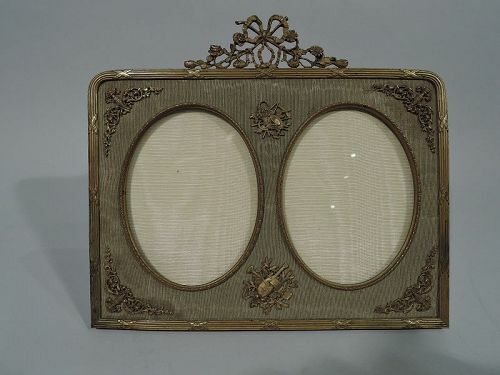 French Rococo Revival gilt-bronze double picture frame. Rectangular with curved corners, reeded rim, and bow-tied floral crown. Two vertical oval windows and ribbed textile ground applied with 18th-century-style garden and music trophies. Subdued, matte, and nicely toned. With glass, textile-lined back, and hinged support. Very good condition. 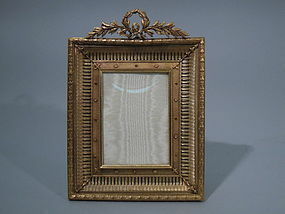 French gilt-bronze frame in Empire style, ca. 1900. 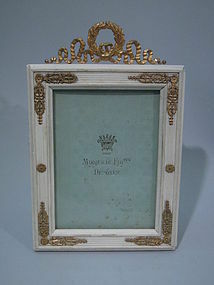 Frame is rectangular and has substantial border with Neoclassical and Egyptian ornament. A laurel wreath is mounted to top. For vertical display. With glass, silk lining, and hinged support. 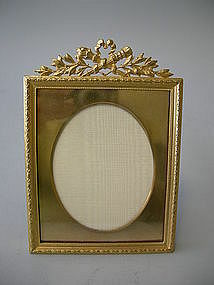 French frame with gilt-bronze mounts, ca. 1900. 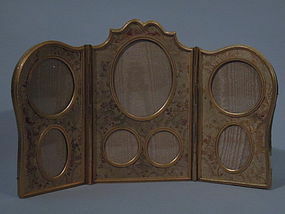 Rectangular and white-painted wood frame with carved reeding and applied gilt bronze mounts. Gilt-bronze laurel wreath and ribbon mounted to top. With glass, lining, and brocade-lined back and hinged support for vertical display. Tiny corner losses. Otherwise good condition. 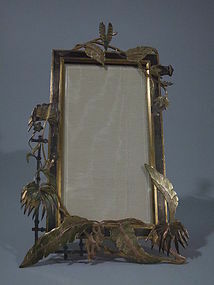 Gilt and polychrome bronze frame with exotic fronds, ca. 1910. Rectangular with colored and etched fronds, flowers, bamboo, and grape bunches. Exciting Japanese-inspired design. With glass, silk lining, brass back and hinged support for vertical display. Support is marked ‘MV’ with hammer. Excellent condition. A charming Dore Bronze Picture Frame with an acanthus leaf trimmed border and a plain dore bronze interior cut to create an oval photograph insert. A figural torch and leaves finial adorns the top of the frame. Madde in France. Circa 1900. Excellent condition. The frame stands 6 in. (to the top of the finial) and measures 4 ½ in. wide. The oval photograph insert measures approx. 2 ¾ in. X 3 ½ in.